Impressions of a Reader...: Winner-1st Anniversary Giveaway! Last week I celebrated my 1st Anniversary AND held my first giveaway! I would like to thank all those who stopped by with warm wishes and congratulations. 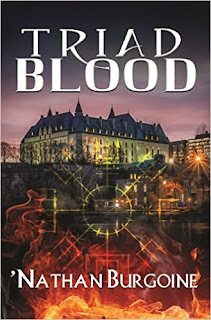 Natasha A. chose Magic Bleeds by Ilona Andrews! This is a favorite Urban Fantasy series, and Andrews a top author on my list, so have fun with Kate, Curran and the gang! Please send an e-mail with your address to claim your prize. Congratulations! HEY! That's me!!! I'm sending you an email right now!! Thank you so very very much!!! Congrats, Natasha! Hope you enjoy Magic Bleeds. It's another awesome addition to Kate's series! Congrats Natasha :D and thank you Hils again for the giveaway! Congrats, Natasha! I can't wait to get my hands on Magic Bleeds myself!!! Enjoy!